Photographer Stojan Stojanovski captured this photo of the penumbral Harvest Moon eclipse at maximum over Macedonia on Sept. 16, 2016. Update for 8 p.m. EST, Feb. 11: The Snow Moon lunar eclipse and Comet 45P flyby wowed stargazers late Friday. See our full story here and check out photo gallery and comet video. Early this evening (Feb. 10), careful observers across parts of North America can watch a Full Snow Moon penumbral lunar eclipse. With a pair of binoculars or a small telescope, skywatchers can also catch a glimpse of a bright-green comet passing by Earth. Comet 45P/Honda-Mrkos-Pajdušáková, which entered the media spotlight in December as the "New Year's Eve comet" when it first became visible, makes its closest approach to Earth on Saturday (Feb. 11). While the comet has been visible for months, this weekend skywatchers will have the best possible view of the blazing space rock. It will also be the closest comet encounter in over 30 years, so it's certainly a must-see for avid skywatchers. Look for Comet 45P in the eastern sky before dawn or in the western sky after sunset. It will be visible all weekend, though it will be difficult if not impossible to spot without the help of binoculars or a telescope. The online astronomy service Slooh.com will webcast two free shows related to the eclipse and the comet tonight. "The Full Snow Moon Eclipse" will air live views of the lunar eclipse at 5:30 p.m. EST (2030 GMT) and be followed by "Cruise the Galaxy with Comet 45P" at 10:30 p.m. EST (0330 GMT Feb. 11). You can also watch both of the broadcasts here on Space.com, courtesy of Slooh. During tonight's penumbral lunar eclipse, the moon will take 4 hours and 10 minutes to glide across the pale outer fringe of Earth's shadow, known as the penumbra. Unlike total and partial lunar eclipses, the moon will stay outside the dark center of Earth's shadow, or the umbra, during this eclipse. Penumbral lunar eclipses are rather subtle events that are usually difficult to detect unless at least 70 percent of the moon’s diameter is immersed within the shadow. Viewers across the eastern and central part of North America might see some evidence of this faint penumbral shading on Friday evening around the time of peak eclipse (7:43 p.m. EST; 6:43 p.m. CST; 5:43 p.m. MST). Farther west in the Pacific time zone, the deepest phase of the eclipse occurs before the moon rises and during the late afternoon hours when the sun is still above the horizon. So viewers out west will likely see no evidence, however slight, of this eclipse. The penumbral eclipse will also be visible in the evening from the Caribbean and eastern South America. In Europe and Africa, it happens in the middle of the night with the moon high in the sky. For observers in western, central and south Asia, it happens before or during dawn on Saturday morning (Feb. 11) local time. At mideclipse, the moon appears in the zenith (directly overhead) from Bamako, the capital city of the African nation of Mali. It might be easier to understand why the penumbral shadow of Earth is so faint by imagining yourself actually standing on the moon when Friday’s eclipse takes place. An astronaut on the moon during this time would see Earth eclipse the sun, but depending on where exactly our hypothetical moonwalker is located, the eclipse will look slightly different. As seen from the Tycho crater — the famous, brilliant lunar impact crater whose rays make it appear like a sunflower on the southern part of the moon — the Earth’s silhouette will appear to take a small nick out of the bottom of the sun; hardly enough to cause any noticeable diminishing of light on the surrounding lunar landscape. Seen from Earth, that's the lower part of the full moon, where moonlight will appear to shine as usual. And this diminished effect of the glare and illumination of sunlight on the moon's surface is precisely what skywatchers in the eastern and central parts of North America will be trying to detect during the deepest phase of the eclipse, concentrating their gaze toward the upper rim of the moon on Friday evening. This image, taken by Akash Anandh in Singapore, shows the varying shadows cast over the moon during the penumbral lunar eclipse on Sept. 16, 2016. Can others see the shadow? Here’s an experiment: At the peak of the eclipse, bring a friend or family member outside with you who knows nothing about the eclipse and ask that person to look at the moon and see if anything seems to look unusual. About that time, even a casual observer — if he or she is looking hard enough — should be able to notice a distinct diminution of light corresponding to a "smudged" or "soiled" appearance on the moon’s upper limb. One final note: if the weather does not cooperate and you end up being clouded out, don’t feel disappointed. Even at its peak, the darkening effect on the moon will be subtle. 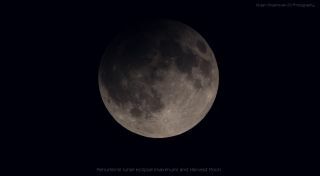 Editor's note: If you capture an amazing photo of the penumbral lunar eclipse or Comet 45P and want to share it with Space.com for a story or gallery, send images and comments in to managing editor Tariq Malik at spacephotos@space.com. Joe Rao serves as an instructor and guest lecturer at New York's Hayden Planetarium. He writes about astronomy for Natural History magazine, the Farmers’ Almanac and other publications, and he is also an on-camera meteorologist for Fios1 News in Rye Brook, NY. Follow us @Spacedotcom, Facebook and Google+. Original article on Space.com.